Note: The Storyteller Reviews are born from conversations between the author and another person. Friend, foe or complete stranger, their opinion and life story dictates the reception to new music. All conversations are transcribed and a story is weaved around as a first person narrative. We hope you enjoy this new feature at Sloucher! A couple of years ago, I went back to Mexico and took a picture of myself wearing a Wet Nuns t-shirt outside my Old Catholic school. Now that they’ve released their album, I got in touch with one of my old teachers, Sister Yolanda, and sent her a link to listen to the self-titled and posthumous album. So, barring a anything lost in translation into English, these are her general thoughts and remarks. Oh, before we continue, I told her Wet Nuns are a Christian Metal band. Selah. “Hi, Samuel, it took me a while to remember which one were you from your generation. Well done on being a music writer and I hope the pay is handsome for you were the one who always worried too much about your work not being good enough when it wasn’t. For the music you sent, I appreciate you remember I was the more tolerant one from MOVEV towards the ‘music’ you and your friends [Translator’s Note: uh, friends?] listened to on those retreats we used to take you kids. With that said, this is a loud racket and it will always be not what we accept as conventional prayer music. I fail to see where are the “religious interpretations” you promised, so I’m annexing Bible quotes so you can reflect on what the song seems to propose to what was taught to you during your 8 years in this school. The number seven, as you remember from Catechism, has a very important place in the Bible.7 deadly sins is a basic one. It took God 7 days to create the world, but it also took Him 7 angels with 7 plagues to fill his wrath. The number therefore alludes to fulfillment; a terminus. I assume what “Wet Nuns” sing about here is about being too satisfied, almost to the point of regurgitating. Perhaps it relates to a band being too satisfied, to the point of any more consumption leads into gluttony. You more than everybody else remembers what happened during your time in school. We know about the great sleep that waits to everyone; that is a certainty that neither science nor religion disagrees upon. I know rock and rollers [Translator’s note: our term is rocanroleros] like to incite people to live life at large and, well, that is good as long as no harm comes to their neighbour. Perhaps the two voices that growl instead of singing are a discussion between Yahweh and Satan, trying to confuse the protagonist of this song? It could work, but I repeat: death is coming for all of us. Matthew 5:29 If your right eye causes you to sin, gouge it out and throw it away. It is better for you to lose one part of your body than for your whole body to be thrown into hell. I assume the band is joking about Hell. This is not a laughing matter and the works of the Devil would like you to think eternal damnation is a reward. The path of the wicked is easy and without complications. The path of the righteous is hard. I think that although there is some good guitar here, this is not a song you want to listen to many times. Joshua 10:26 Then Joshua struck and killed the kings and hung them on five trees, and they were left hanging on the trees until evening. Ah, this is a more interesting for interpretation, especially since the ending is ominous. Remember the book of Joshua, that after the circumcision in the hill of foreskins (Joshua 5:3), Joshua’s conquest continues, ending with the hanging of the 5 kings (Joshua 10:26). I’m assuming the staccato (remember how you hate that word?) approach the song has is describing the horrors of a Biblical war. The mournful violins seem to be helping affirm this idea. Numbers 9:20 Sometimes the cloud was over the tabernacle only a few days; at the Lord’s command they would encamp, and then at his command they would set out. From the introduction of the song, I assume this is related very faintly to The Great Deluge. The slower pace and the strange but understandable noisier parts are the indicators that this is a tenuous chant about said act that God promised not to do again. This is the greatest lesson you can take from the Old Testament: learn from mistakes and develop patience. Numbers 11:33 But while the meat was still between their teeth and before it could be consumed, the anger of the Lord burned against the people, and he struck them with a severe plague. I do remember you were always a fan of The Book of Numbers and I’m sad your imaginative but pretentious essay about “Robotech and Numbers : Generations” made the Headmaster ground you to chalk eraser cleaning duties for 2 weeks. Numbers marks one of the “angry God” parts of the Bible, so I guess the “broken teeth” are the swaths of people God had to smite down after their faiths doubted Aaron and Moses. So, since that generation failed, a new one had to come up and do God’s proposed work. The teeth that fell have been replaced. I don’t want to see your face no more. The anger and frustration by the narrator seem to reflect on Peter’s denial of Jesus at the Garden of Gethsemane. The fact the song is a little over three minutes reflects clearly the times Peter denied Jesus and how he then feared Jesus would never want to see him ever again. It’s an interesting spin, but I don’t get why they would call each other “baby”. I fail to see any relationship with the Bible, unless “throttle” is used in the second interpretation you told me. I assume you are correct and quote Matthew 13, which, as you know, is the parable of the Sower. This dark sounding song might be more about the ones lamenting that a seed that lands in a barren, thorn-laden wasteland will eventually choke. Thank you for getting in touch after all these years. Perhaps another visit to the school can be arranged if you want to talk further about religious music? Words: Sister Yolanda, as told to Sam J Valdés López. 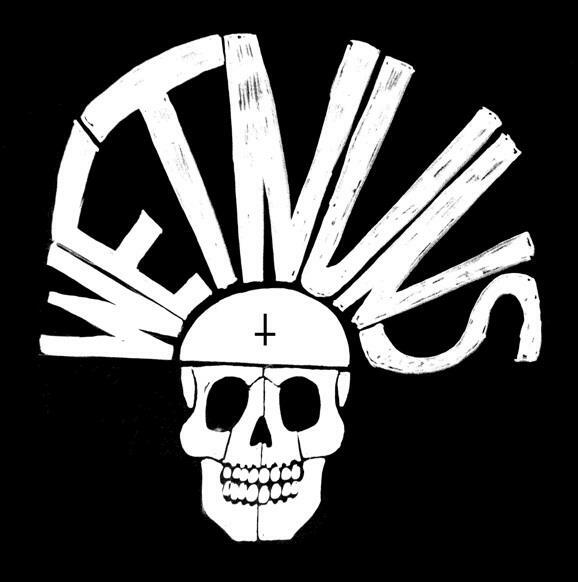 RIP Wet Nuns. We shall miss you. Posted in Apocalyptic stuff, rant, reviewsTagged a last hurrah, Bible quoting, Colegio vallarta, Sheffield Alabama, Wet NunsBookmark the permalink.